Indulge in a lighter than air dessert. Vanilla Panna Cotta is a scrumptious treat you can’t stop craving! 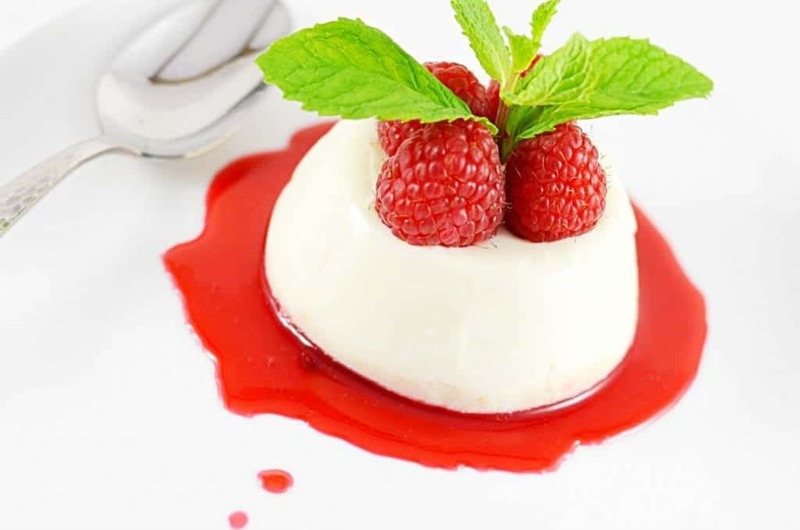 Vanilla Panna Cotta is a classic Italian dessert, made of milk, cream and gelatin. The first time I tried Panna Cotta was during my family’s trip to Slovenia 5 years ago. It is a very small country in the heart of Europe. But since the south of Slovenia borders with Italy, traditional Italian cuisine could be found almost in every Slovenian restaurant. As soon as I tried this delicious creamy treat, I was conquered. The dessert is literally mouthwatering. It is so light and creamy with a nice vanilla flavor and just enough amount of sugar to keep craving this recipe more and more. Naturally, after I’ve tried Vanilla Panna Cotta the first time, I kept ordering it every time I would go to a cafe or restaurant. The taste is so decadent that you simply can’t stop eating. Usually, when I cook desserts, I try to ease on sugar. Because as I noticed with many traditional dessert recipes, they require enormous amounts of sugar. In my opinion, it just spoils the taste of a dessert. So, for this particular Panna Cotta recipe I took just enough amount sugar to lightly sweeten the dessert and gently highlight the taste of its ingredients. The preparation of Vanilla Panna Cotta is one of simplest ever and will take you no more than 10-15 minutes. I didn’t have ramekins of the same capacity, so I used regular tea cups, which I filled halfway with the Panna Cotta mixture. Dissolve powdered gelatin in 5 tablespoons of water. Let it stand for 10 minutes. Heat the half and half, milk and sugar in a medium saucepan. Stir the mixture occasionally until the sugar dissolves and remove from the heat. Don't boil. Slightly cool the Panna Cotta mixture until just warm. Stir in the gelatin until it is completely dissolved. Lightly oil the ramekins with a neutral-tasting oil. 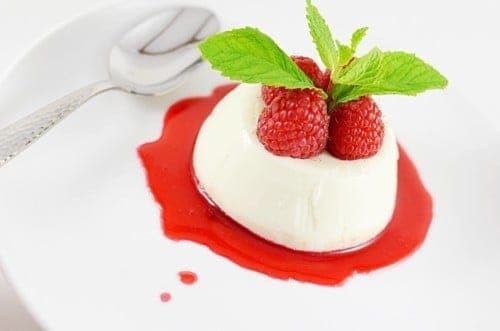 Ladle about ½ cup of the Vanilla Panna Cotta mixture into each ramekin and chill them in a refrigerator until firm, at least 4 hours or overnight. To remove Panna Cotta from the ramekins, run a sharp knife around the edges of Panna Cotta. Dip each ramekin into a bowl with hot water for a couple of seconds and invert ramekin onto center of a small plate. Serve with fresh raspberries and a jam of your choice. Welcome to Yum Goggle! We are now following you on ALL your social media and hope you will follow us back. We will do our best to tag you each time we promote your posts. Kelli at YG. Thank you so much Kelli! I followed you back!